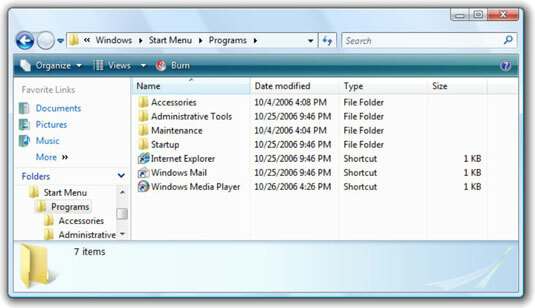 If you know how to rearrange the All Programs submenu, you can untangle and organize the mess in your Start menu. Every time you choose Start→All Programs, Windows reaches into four folders and assembles the entire tangled mess you see on-screen. 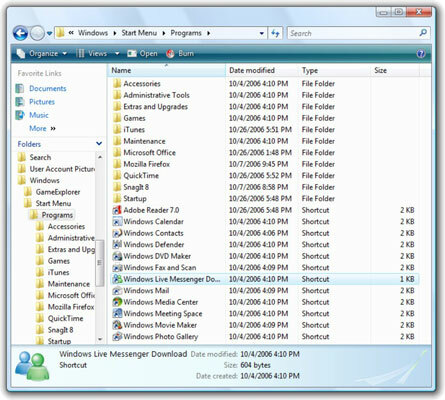 To organize the submenu, unfortunately, you have to organize the folders that Vista uses to populate the submenu. Rearranging the All Programs submenu rates as a high-payoff timesaving technique. If you’ve ever lost five minutes wading through All Programs’ endless (and frequently meaningless) menus, you know why. You need to be set up as an Administrator in order to change the All Users folder. That’s where you’re likely to find the most junk that needs trimming. 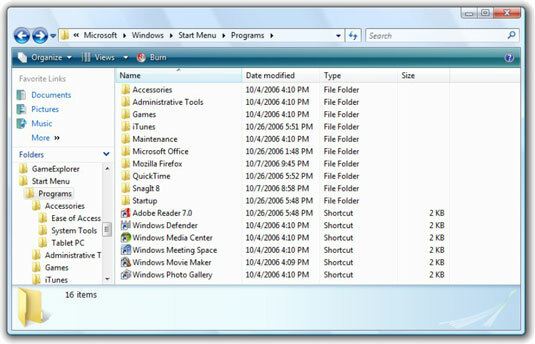 The files and programs that are currently loaded are going to vary from computer to computer. 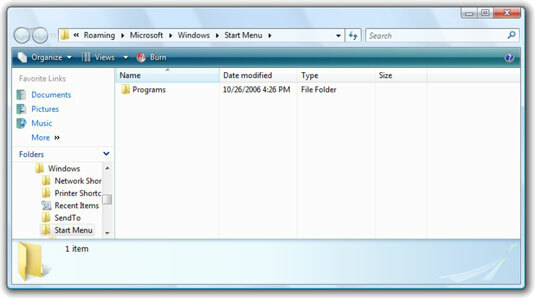 This is the step-by-step process to clean up these folders on a typical user’s computer. However, the files and programs you find on your computer might be slightly different. Don’t let this worry you; just use your best judgment. Right-click Start and choose Explore. That opens the Start Menu folder. For this user, there isn’t anything in there to gum up the All Programs menu. Whew. 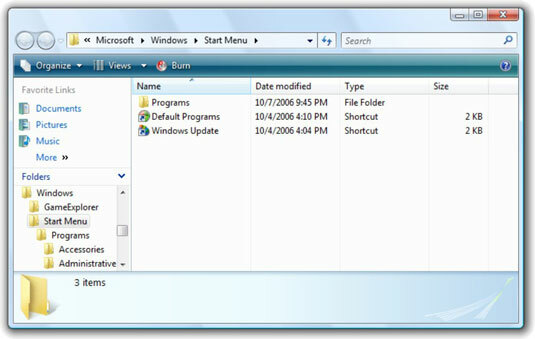 Double-click the Programs folder and make any worthwhile changes here. Now you’re getting to the garbage. Let’s see what can be done. Duangkhae can’t stand Windows Mail and has no intention of ever using it, so she right-clicks the Windows Mail icon and chooses Delete. She already pinned Windows Media player to the top of her Start menu, so it doesn’t need to go here, either — right-click and delete. She has nothing in the Administrative Tools folder, so the whole folder gets the right-click-and-delete heave-ho. When you delete shortcuts through this process, it only eliminates the shortcut, not the actual program itself. Right-click Start and choose Explore All Users. 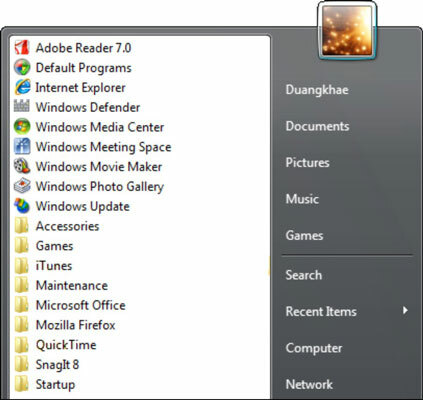 Explore All Users put us in Duangkhae’s “All Users” Start Menu folder, which is clean and has nothing in there worth deleting. Double-click the Programs folder and slash and burn. As you can see, there is a lot of stuff in the Programs folder. Surely something can be cleared out. The Extras and Upgrades folder — which contains Microsoft’s infamous link to the pay-more Windows Marketplace, as well as other nifty Microsoft advertising locations, gets the right-click-and-delete treatment. Because Microsoft really wants to keep the option of convincing you to spend more money, you’ll probably have to click through multiple security messages to complete the deletion. Windows Live Messenger Download goes. She doesn’t use Windows Calendar or Contacts, so they’re out, along with Vista’s (questionable) DVD Maker. Finally, yet another Windows Mail icon bytes the dust. Because she doesn’t fax, and scans directly from a separate program, Duangkhae gets rid of Fax and Scan. If you have Office 2000 or XP (and a lot of you never came up with a good reason to pay for the newer versions), you’ll undoubtedly see four Office application icons in the Programs folder. Move them to a less obnoxious location by right clicking the Microsoft Office Tools folder, choose Rename, and rename it MS Office. Then click and drag each of the four Office applications, in turn, into the newly renamed MS Office folder. When she finishes, Duangkhae’s considerably simpler Programs folder looks like the following figure. Get rid of the junk you don’t ever use. “X” out of Windows Explorer. Choose Start→All Programs and make sure the menu looks right. Duangkhae’s final, timesaving All Programs menu. When it comes to saving time, day in and day out, Duangkhae’s much simpler All Programs menu runs rings around the original.